Geranium Pinktastic – is the easiest to select, grow and sell! 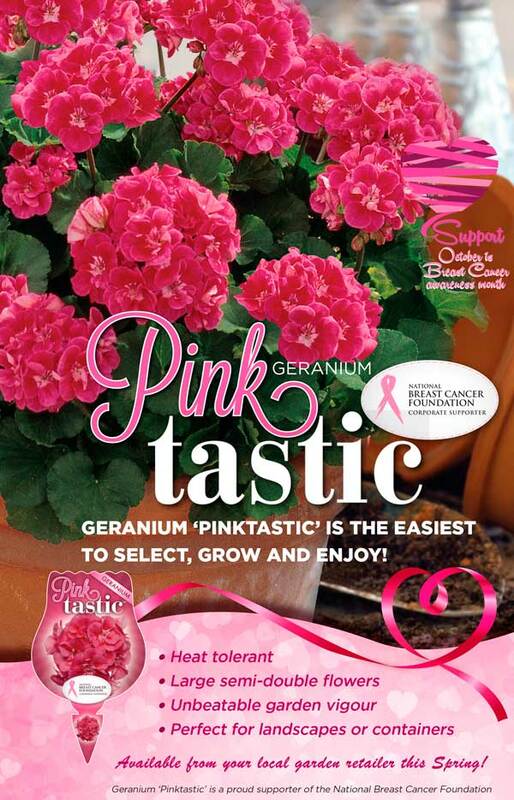 A cause-related marketing program in conjunction with the National Breast Cancer Foundation (NBCF), Geranium ‘Pinktastic’ is set to brighten up gardens delivering appealing ‘pink results’. The program has a purpose designed label of which 20c from the sale of the label goes back to the NBCF. Big, hot pink blooms sit tall and strong above rich dark green foliage, making Geranium ‘Pinktastic’ a stand out! Being heat tolerant, it will bloom all summer long which means Geranium ‘Pinktastic’ will offer a vibrant, profusion of blooms for the home garden. It’s robust mounding habit with large uniform semi-double flowers makes Geranium ‘Pinktastic’ perfect for mixed beds, borders, containers and hanging baskets. Geranium ‘Pinktastic’ is available at all good garden centres.